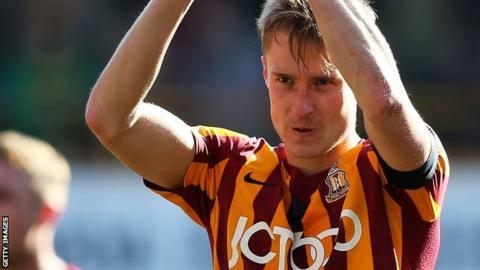 Bolton manager Phil Parkinson has described Stephen Darby as a "fighter" and a "top-quality person" following the full-back's retirement after he was diagnosed with motor neurone disease. Defender Darby, 29, played under Parkinson at both Bradford and Bolton. "It's hurt us all and our thoughts are with him and his family," Parkinson told BBC Radio Manchester. "It's hard for anybody who gets this news, but I've been through a lot with Stephen over the years." Bolton travel to Middlesbrough for a Championship match on Wednesday with Darby very much in the thoughts of his team-mates and the club's staff. "As you can imagine, when I told the lads on Monday it was a very sombre training ground," said Parkinson. "Stephen spoke to the group on Tuesday morning and wants us to put in a performance to reflect what he's all about and I think that's really important. He's a fighter and that's what we're going to try to do on Wednesday. "He keeps saying to me that he doesn't want this to affect preparation for the games, and that's the type of person he is. We tell him not to worry about that - we just want to make sure that he's all right." Parkinson was in charge of Bradford when he first signed Darby, who had just been released by Liverpool, in the summer of 2012. Darby made his first-team breakthrough at Anfield under manager Rafael Benitez. "I was proud to give Stephen Darby his Liverpool debut and now I am deeply saddened to learn of his retirement," Benitez said of the news. Bradford were in the fourth tier, having been in the Premier League 11 years earlier. Darby's first season with the Bantams contained an unforgettable run to the final of the League Cup - he scored a 30-yard winner in round three against Burton - and ended with promotion from League Two via the play-offs. The right-back also captained the Bantams when they caused one of the biggest shocks in FA Cup history, coming from 2-0 down to beat Chelsea 4-2 at Stamford Bridge in round four of the FA Cup in January 2015. Parkinson recalled: "I remember meeting Stephen to sign him at Bradford and I've thought about it a lot in the past week or so. "I remember saying to him 'this is what we need - we're trying to rebuild this club, we need people who will be committed every single day, so come on a journey with us'. I could feel him looking at me as if to say 'you're talking about me'. "He came on board and the Bradford people will tell you about his contribution and his spirit. He had a never-say-die attitude on the pitch and he was a great player for Bradford through some terrific times." Parkinson joined Bolton in 2016 and a year later, having guided them to promotion to the Championship, re-signed Darby. Wanderers battled against relegation for most of the season and stayed up by beating Nottingham Forest on the final day of the 2017-18 campaign. "He hasn't figured as much as he would have wanted, but people can contribute in other ways and that's certainly what he's done," added Parkinson. "One thing that kept us going through some tough times was the lads who weren't in the team training well, supporting the lads in the team, not getting too disheartened. "Stephen kept the professionalism in that group and that's very important. If they become disaffected, it can spread through the club."